Legal funding has been growing at an exceptional rate since its inception. It’s a financial trend that has flourished in the U.S. justice system. Lawsuit funding companies are at the forefront of marketplace solutions for lawyers and clients. 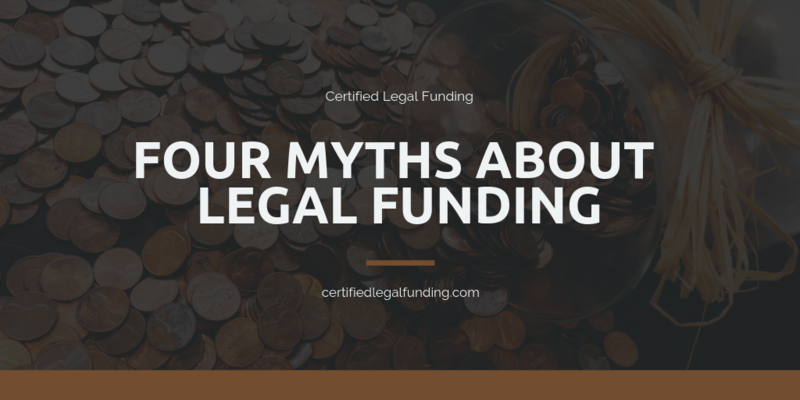 Although funding companies became extremely important, certain myths about legal funding still persist. Read on and find out which myths are the most common ones. Misconception number one is that legal funding exists to take advantage and exploit plaintiffs in the moment they’re not able to make informed decisions. This opinion is most prevalent among lawyers who are afraid that their client’s situation may be used for someone else’s advantage. Let’s break this myth! The reality here is that cash advances are there to help people who are backed into a financial corner due to an accident and slow legal process. Being involved in an accident and suffering injuries which prevent you from going to work may present a real challenge when it comes to addressing basic living expenses. With pre-settlement funding, a plaintiff will feel certain relief from accumulating bills, inability to pay medical expenses or provide food and housing for their family. Traditional loans and any credit alternatives are different from legal funding. On the surface, they may seem to be one and the same thing, but they are not! The main difference here is that traditional loans need to be paid back, usually on a monthly basis. When you take a traditional loan, you have to pay it back regardless of whether your lawsuit was successful or not. However, when you have a legal funding agreement, you only pay the company their fee when your case settles successfully. If the lawsuit is unsuccessful for some reason, the client has no obligation to repay any amount of money. Many attorneys believe that funding companies interfere in the legal process and put pressure on them to settle the case as fast as possible so they can get their money. This is far from the truth. There’s a strict practice of non-interference and all legal strategies and settlement decisions are entirely made by the client and his/her lawyer. At its inception, this industry was lacking regulation and oversight, but as it continued developing it became more and more regulated and today there are strict practices designed to protect plaintiffs’ best interests. The industry’s trade association, ALFA (the American Legal Finance Association) is making sure and leading the way to establish the highest standards in this business. If you ever come into a position of needing pre-settlement funding, feel free to contact experts at Certified Legal Funding, who will help you get over the period when you need stable finances the most. Call today at 800 922-7439!